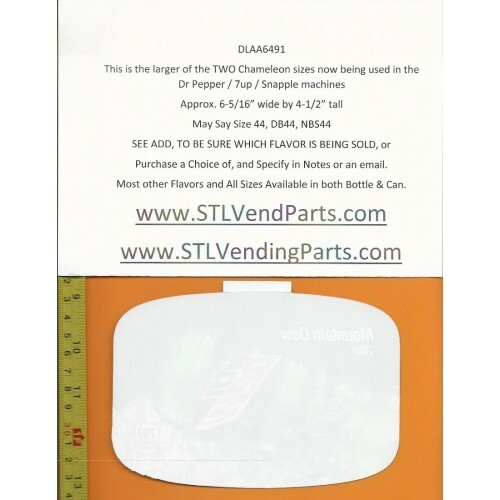 This is the larger of the two Chameleon Sizes used in the new 7-Up Dr Pepper or Snapple branded Machines. they are approx 6.3 x 4.5375" or 6 5/16" x 4 1/2". Available in Most of the Popular flavors from Coke, Dr Pepper and Pepsi. May say Size 44, NBS44, DB44. Most are Manufactured by Royal Vendors, but could be a Dixe Narco or Vendo. 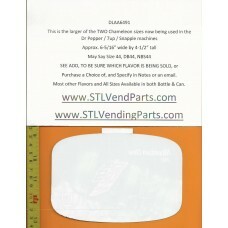 These tags fit in the very large buttons or pockets on the back of the plexi glass on newer Dr Pepper Machines. As such they are Primarily available in Dr Pepper brand flavors. and the most popular flavors of Coke or Pepsi.